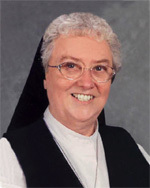 Sister Anita Regina Timlin, I.H.M. Sister Anita Regina Timlin, I.H.M., died Dec. 11 in Camilla Hall, Immaculata, in the 65th year of her religious life. She was 83 years old. Born in Philadelphia, Sister Anita entered the Congregation of the Sisters, Servants of the Immaculate Heart of Mary in 1949 from Transfiguration Parish in West Philadelphia and professed her vows in 1952. She taught in various grades in the Archdiocese of Philadelphia and the Dioceses of Hartford and Camden. For the last 10 years of her life, she did pastoral work in St. Raymond Parish and St. John Neumann Parish in New Jersey. The funeral Mass was celebrated at Camilla Hall Dec. 16. Father William Dean was the celebrant and homilist. Sister Anita is survived by members of her religious community, by her sister-in-law Edith Timlin (Thomas); and many loving nieces, nephews, grandnieces and grandnephews. She was predeceased by her parents Norman Leo Timlin and Audrey Potts Timlin, brothers Thomas and Eugene (Gertrude) and her nephew Patrick Timlin. My deepest sympathy to the IHM community and to the Timlin family. Sister’s brother Gene was married to my cousin Trudy. My cousins, children of Gene and Trudy, have suffered over the years. My prayers are with them.